Coastal planners, fishery managers, and oceanographic researchers received important seafloor and water column data from the special survey of Quinault Canyon completed in May 2016 by the NOAA Ship Rainier. The survey, a collaboration between Olympic Coast National Marine Sanctuary and NOAA’s Integrated Ocean and Coastal Mapping program, grew from a 2013 seafloor mapping prioritization exercise among coastal stakeholders from federal and state (Oregon and Washington) agencies, tribes, and academia. 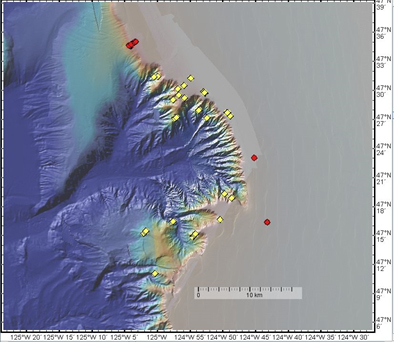 The group prioritized offshore areas where seafloor mapping is needed due to poor understanding of canyon depths, seafloor structure, and benthic habitats required for responsible marine research, monitoring, and management. 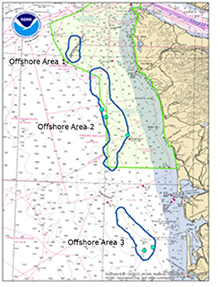 Offshore Area 2 – Quinault and Quileute Canyons – was selected for Rainier’s first mapping survey. These are unexplored canyons, significant natural features influential on the local ecosystem and oceanography, which are targeted by commercial fisheries. Bathymetry and backscatter data from this 2016 Rainier survey are available at https://www.ngdc.noaa.gov/nos/W00001-W02000/W00306.html . Oceanographers at University of Washington and NOAA’s Pacific Marine Environmental Lab are reviewing the water column data for methane seeps and plumes.